How has alien detention developed across the Americas over the course of the late nineteenth and twentieth centuries? In the United States, federal detention of immigrants began in the early 1880s to enforce the government’s first national immigration laws against Chinese laborers and people with contagious diseases and mental illnesses. Today, almost half a million aliens are detained each year in the United States, making up the fastest growing part of the prison population. During WWI and WWII, hundreds of thousands of suspected alien enemies were jailed in concentration camps. In one particularly salient example of transnational collaboration during WWII, tens of thousands of Japanese, German and Italians residing in 13 Latin American countries were rounded up and sent to US detention facilities. Some of these detainees were forcibly sent to Axis countries in a prisoner exchange program. After the war, some of were allowed to remain in the United States while others were deported back to the countries from which they had been taken. Foreigners were jailed for mental illness at rates far greater than US-born citizens in the United States at the beginning of the twentieth century. In particular states like New York, almost one-third of all patients in hospitals for the insane were foreign-born. Along with discriminatory diagnoses of contagious disease at ports of entry, targeting foreigners as mentally ill was a medical means to manage the immigrant population. Taken together, these various mechanisms of alien incarceration developed into a massive machine in the 1980s that began to warehouse refugees seeking asylum in the US, migrants who entered the country without authorization, and other foreigners who had committed crimes. While many Axis nationals residing within the United States were detained during World War II, the creation of the Special War Problems Division in 1941 widened the scope of the State Department’s hunt for “enemy aliens” to include Latin America as well. Secret agreements were reached with thirteen different Latin American governments preparing for the arrest and deportation of enemy aliens. Throughout the war, over 4,000 Germans, 2,000 Japanese and almost 300 Italians were deported from Latin America and brought to internment camps in the U.S., while others were targeted by FBI agents working for the U.S. embassy as hostages to be used in exchange for U.S. Prisoners of War. Among those forcibly repatriated during the war were Jewish refugees fleeing persecution in Europe and naturalized U.S. citizens of German, Italian or Japanese descent and their American-born children. 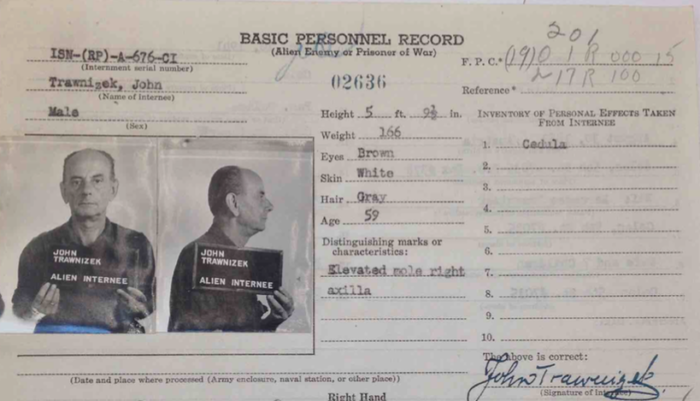 John Trawnizek was an Austrian engineer classified as a “friendly alien”, but was nevertheless detained while working in Panama and brought to a detention camp in Seagoville, Texas. 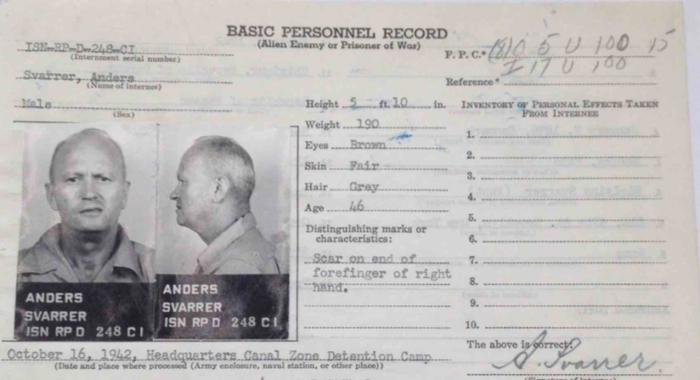 Anders Svarrer was another “friendly” alien who was interned in a Panamanian jail for eight months in 1942 before being transferred to a U.S. interment camp in Kennedy, Texas with no hearing. Elliott Young is Professor in the History Department at Lewis and Clark College, where he teaches Latin American and Borderlands history. He is currently director of the Ethnic Studies program, and has directed Latin American Studies and served as chair of the History department. In 2003, he co-founded the Tepoztlán Institute for Transnational History of the Americas, which brings together scholars from throughout North and Latin America for an intensive weeklong workshop on transnational history in a small town outside of Mexico City. Professor Young published three books on borderlands, migration and transnational history, Alien Nation: Chinese Migration in the Americas from the Coolie Era through WWII (UNC Press, 2014) Catarino Garza’s Revolution on the Texas-Mexico Border (Duke University Press, 2004), and Continental Crossroads (Duke University Press, 2004), a volume of essays by new scholars in the field. The award-winning, Catarino Garza’s Revolution on the Texas-Mexico Border was published in Mexico in Spanish in 2010. He has published widely on borderlands and transnational history in academic journals, including Past & Present, theWestern Historical Quarterly, Mexican Studies/Estudios Mexicanos, Cuban Studies and the Southwestern Historical Quarterly. His columns have appeared in the Huffington Post, Utne Reader, Oregonian, Portland Tribune, Oregon Humanities, and the History News Network.